I was asked to make this wedding card and was not really sure if this is what they want but I am sure they will tell me if it is not. I think it is quite plain and simple and plenty of white space. I started with a white base card and added a lilac layer. 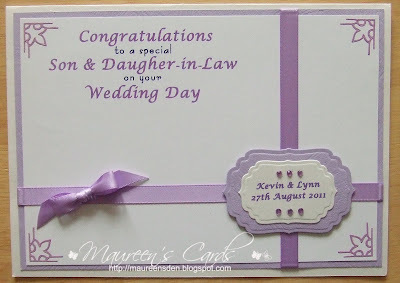 The sentiments were printed directly onto another layer of white card and I added lilac peel-offs to the corners. The ribbon is from the Fizzy Moon Collection and I have cut the shapes with nesties labels 4 and added some gems. 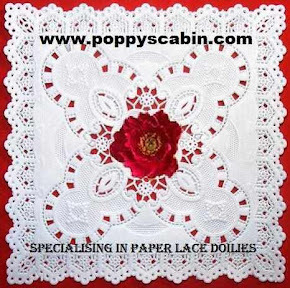 I do so many personalised for weddings, it;s the perfect occasions for them! 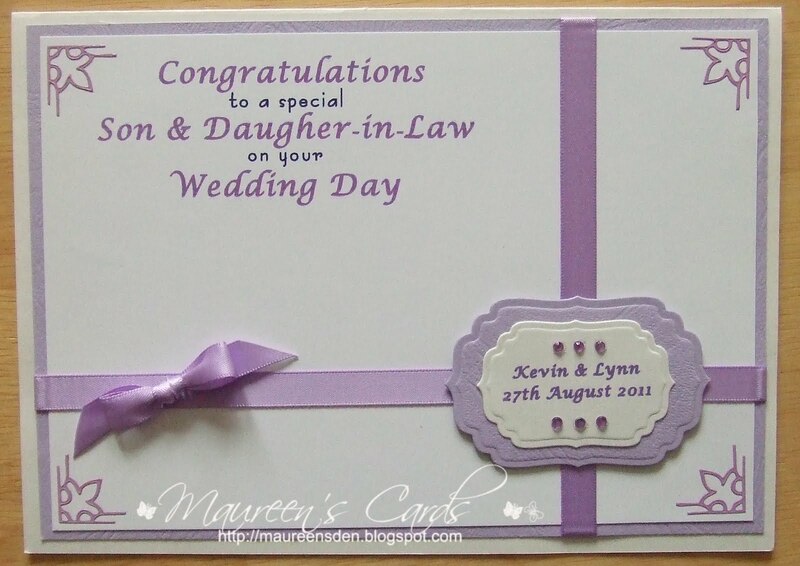 Lovely colours Maureen, nice card too. Thank you for joining us at Paper Creator Crafts. Maureen this is a pretty card...I really like the way you have used the ribbon. 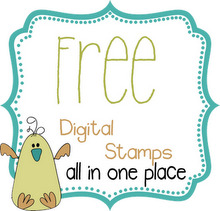 Thanks so much for joining in our Celebration challenge at Unstampabelles. Lovely card and very stylish indeed and why wouldn't they like it ! It's fabulous. Beautiful card! Really like the corners! Thanks for joining our first challenge over at Unstampabelles! Super card, I'm sure the recipients will be delighted! I am sure the card will be well received. I really like the softness of your card. Thanks for joining our first challenge at UnstampaBelles. I think it is very elegant and beautiful. Thanks for joining us this week at Crafts and Me Challenges.